There seems to be a fine line between situational awareness and full-blown paranoia. 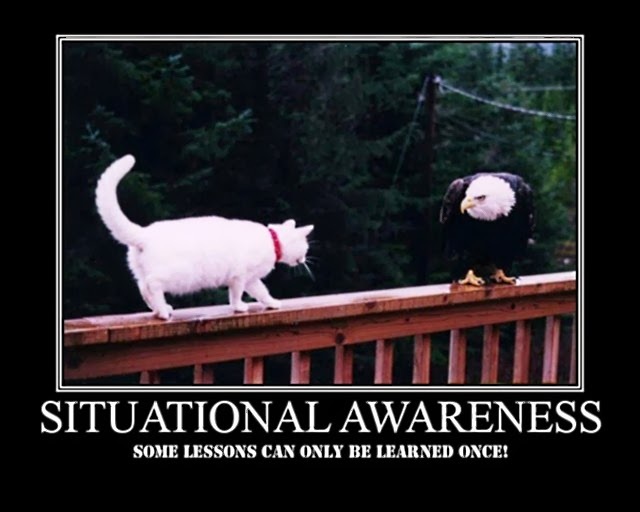 As martial arts instructors, we like to promote awareness but we don't want to push the students and ourselves over the line into paranoid delusion - or do we? I mean, we do stand to benefit in a business sense, by amplifying our students' fears while setting ourselves up as the solution. But that's not what we're supposed to be about. We are supposed to be about alleviating fear through skill and confidence. I think as martial arts instructors, in the face of this potential conflict of interest, we should be alert to that sort of behavior in ourselves. I went to a play in New Orleans this past weekend with my wife. I absolutely hate New Orleans with an undying loathing, Everything about the city sets off my paranoia Add to that the recent media coverage of the "knockout game" and I end up sore the next few days because of the tension of constantly being on the look-out, constantly scanning every passer-by for potential weapons or pre-attack indicators (like changing gait right as they get to ma-ai). The time for war has not yet come, but it will come, and soon; and when it does come, my advice is to draw the sword and throw away the scabbard. To be alive and sane, you have to live in one mode or the other - you have to give yourself 100% to love and peace, or 100% to the destruction of war - and you have to do each at the right time, and you have to be able to switch modes at the right times and completely. If you try to do both at the same time, you cannot be effective at either. I suppose that might be the origin of the term, paranoia - meaning beside mind or 2 minds, or something like that. My New Orleans experience reminds me of an old sensei who told us that in order to develop and ingrain the "step offline at ma-ai" habit, he never shook hands or even hugged his mom without first stepping off-line of engagement at least slightly. Is this aiki handshake a genius way of training that reaction or is it a sign of an unbalanced paranoia? Is it possible to develop a good sense of situational awareness that will save us when the feces hits the oscillator but will not drive us insane? Here is one hint at training that sort of awareness.